Mountain Cove Journal and Spiritual Harbinger. 1/1, August 12, 1852-October 20, 1853. $1.00-$1.50 a year, 4 pp., 22x32. There is considerable evidence that the journal was published from Auburn, New York, as the Harbinger from mid-1851 on, at least on an irregular basis. The journal, when established in Virginia, was "the organ of the Colony of Spiritualists who have settled in Virginia, and the vehicle for the continued publication of the 'Disclosures from the Interior.' The beautiful 'Disclosures to the Auburn Circle' are being republished in its columns, with many startling manifestations, prophetic announcements, and revelations of higher life in worlds unfallen and pure. The poetic beauties of these communications would alone entitle them to a high consideration; whilst the scriptural expositions, devout meditations, religious and spiritual instructions, recommend them to every inquirer who seeks God in the great unfolding." Advertisement in Spiritual Telegraph 1/51 (April 23, 1853). The journal's own self-advertisement claimed: "Devoted to the publication, discussion and elucidation of Theories, Principles, Facts, Legends, and Traditions—Historical, Social, Political, Industrial, Scriptural, Ethical, Metaphysical and Cosmical—connected with Man, with his Genesis, and prospective and anticipated Exodus from Moral, Mental and Material Darkness; and as pertaining to the Origin, Unfolding and Consummation of the Material and Spiritual Universe." Despite the high-flown promises the journal was largely a forum for Harris's prose and poetry, together with Scott's notes on the trance mediumship of Marietta Davis, and reprints of Disclosures from the Interior. It devoted a surprising amount of space to "Book of the Outlines of the Universe," visionary descriptions of the planets and asteroids and their inhabitants—"Odora," the planet Mars; "Majestica," the planet Jupiter, etc.). Pallas, for example, was "inhabited by a race of beings comparatively minute, spherically encompassed and protected by adornments which correspond to the externals of the nervous constitution of man. They are human beings, and having attained to the fulness of their terrestrial exaltation, they are translated and finally ascend to fulfill important offices in the spiritual empires which revolve in the ethereal expanse, whereof disclosure at a fitting period will be made." The journal was explicitly opposed to A.J. Davis's Harmonial Philosophy, despite Harris's earlier association with Davis, because of the perceived anti-Christian tendencies of the Harmonial Philosophy, and proposed in its stead its own Christian Theory. From the compound title and other indications, the journal also seems to have incorporated an antecedent Spiritual Harbinger from Auburn. The last number of the journal (October 20, 1853) announced that the "Disclosures from the Interior" that had hitherto been appearing in the journal would be put out serially, beginning with November 15, 1853, as "The Disclosive Encyclopedia, A Compend of Truths, Knowledges and Historical Narrations, derived from the Internal Sense of the Word, from the ultimations of Divine Love and Wisdom, and from Vocal and Visual Communications with the Spirit World and with the Heavenly Spirits." This was to be communicated through Harris and sold in 13 installments of 32 pages each, for $1.00. 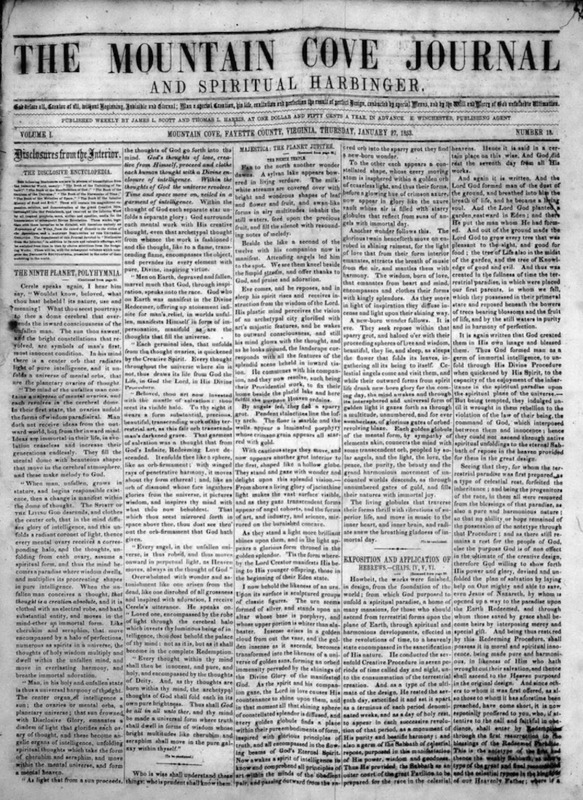 The same issue of the journal advertised its press for sale (for $160), marking the end of the venture. Library of Virginia; West Virginia University; University of Alberta; SUNY Fredonia (1 issue).